Norway has relaxed the prison conditions of mass killer Anders Behring Breivik after in April a court ruled that extended isolation had violated his human rights. This decision provoked outrage among government officials who argued that a "locked world" was best suitable for the notorious right-wing extremist who killed 77 during a spree in 2011. According to documents released earlier this week, conditions for Breivik have been relaxed, including that he no longer had to speak to his lawyer through a glass wall but rather through ordinary bars. Breivik has also been granted increased opportunities for physical training and staying outdoors, as well as meeting a "visitor friend" from a local church, Norwegian newspaper Verdens Gang reported. 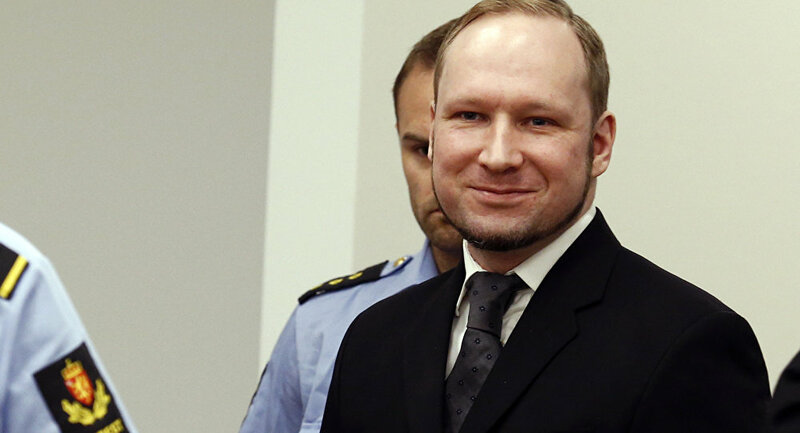 "Contact has been eased somewhat, but he is still cut off from receiving visits from lawyers in a normal way in a visitors' room," Breivik's lawyer Øystein Storrvik wrote, claiming that the "overall pressure of isolation" was maintained. So far, Breivik has spent five-and-a-half years in isolation with no contact with other prisoners and restrictions on his correspondence. His mother was the only family member who was allowed contact with the mass murderer and gave her son a brief hug in 2013 shortly before she died of cancer. A controversial court ruling in April found that Norway allegedly violated Breivik's human rights by keeping him isolated, which stunned survivors of the Utøya attack and the victim's relatives. In court, Breivik complained that he was feeling bad in jail, confined to a three-room cell, grumbled about cold coffee and lashed out against prison food which he called "a torture worse than waterboarding." Norwegian Attorney General Fredrik Sejersted argued the state was continuously revising restrictions on Breivik and ensured that none of the recent changes were prompted by the court ruling. Sejersted disagreed with the allegation that Breivik was kept in "isolation," arguing that Norway's most famous prisoner had had contact with other people, even though they were professionals including guards, lawyers and health workers. Accordingly, the Norwegian state was reported to prepare an appeal against the ruling, citing Breivik's still-draconian jail conditions were fully justified. "Our view is that the conditions of Breivik's detention fall well within the permitted of the European Court of Human Rights," Sejersted said. — Ana Kasparian (@AnaKasparian) 13 ноября 2012 г. ​Since August 2011, Breivik has been imprisoned in a section with "particularly high security." The type of isolation is called "relative social isolation." Additionally, his correspondence by traditional mail is subjected to opening and inspection. As part of compensatory measures, Breivik is permitted to own an electric typewriter and a video game console without internet connection. His cell also has a treadmill and a private bathroom. According to previous estimates, Breivik's detention costs the Norwegian state 4.6 million NOK a year (roughly $530,000). The militant right-wing extremist killed 77 in a shooting and bombing spree in July 2011 and is serving a "life imprisonment," which is in effect a 21-year sentence that can be extended if the prisoner is still considered a threat. Ironically, Breivik himself is known to suggest that isolation is "the most effective way" to radicalize people, since one never gets corrected by others.